I am still not asking “What have we done?” but that is probably because I am too tired to think. But then I sit and look at the cute (because she is sleeping) puppy under my left arm as I type this and realize there are benefits. After several years without a dog, we have become dog owners again and like several other things in our life, we didn’t go small or easy. We got two puppies at the same time. The Proclaimers had their song “I’m Gonna Be” where they say they will walk 500 miles and 500 miles more. Well, we didn’t walk but we did drive 1000 miles for these pups. The story goes like this- we had finally come to the decision to get a dog. We realized that our schedules are not going to free up any more in the near future. The boys are getting old enough to help. We aren’t going to suddenly have more free time at home (which was the biggest obstacle, making sure the dogs were not home alone too much) but we did realize through some basic planning adjustments we can get someone home early enough. So we decided to pull the trigger. A close friend knew we were starting to look and she had a neighbor who helped transport dogs from shelters to foster homes. She let us know when puppies were making their way through our area. 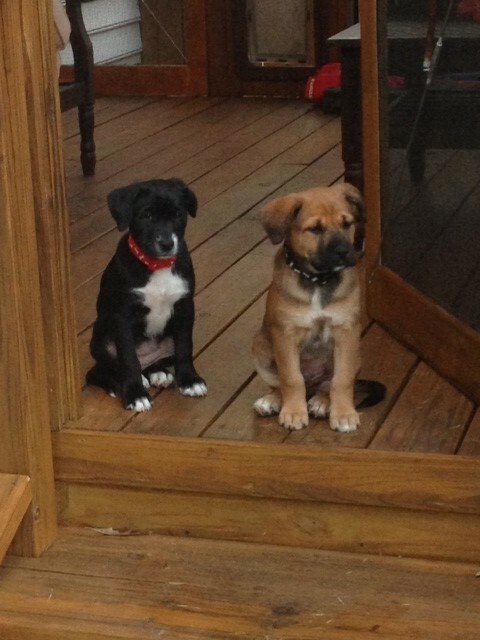 The second alert of puppies being hosted by her neighbor included pictures – they were, of course, adorable. We arranged to go see them when they made it to her house late on Saturday night. We shared our interest and the lady who was transporting said that these puppies were on their way to foster homes in Rhode Island but they can typically transport them back down if adopters are found along the way. We really wanted to take them home that night but that wasn’t “officially” an option (within the rules). We completed the online forms for the organization in charge of the adoptions (Save A Lab) and contacted them with our intent. During the following week several emails went back and forth. On Sunday it was looking like we might not be able to get the puppies – the organization said they were being adopted in Rhode Island, they already had people interested in them and they were steering us to puppies available in Virginia. We were persistent and became more entrenched in our decision for these two puppies as the obstacles stacked up. Guess I am just a little hard headed. Things turned our way mid week. The other interested party backed out. We were approved for adoption and we had our two choices. But, they were not willing to arrange to transport them back to VA. If we wanted them we would have to go to Rhode Island to pick them up. We prepared for a road trip. On Saturday, February 1st, my oldest and I headed North. We drove up I-95 through Maryland, Delaware, New Jersey (passing MetLife stadium where the Super Bowl would be played the following day) and through New York where we got to see the Manhattan skyline. We stopped for dinner in Connecticut on the edge of the Yale campus. We arrived in Rhode Island after eight hours on the road. My oldest did a great job serving as navigator on the iPad and made the comment that night “that didn’t seem that long”. 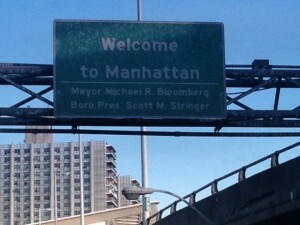 It was a good trip – a little traffic in New York but otherwise uneventful. 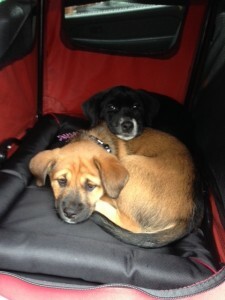 The next morning we picked up our puppies. 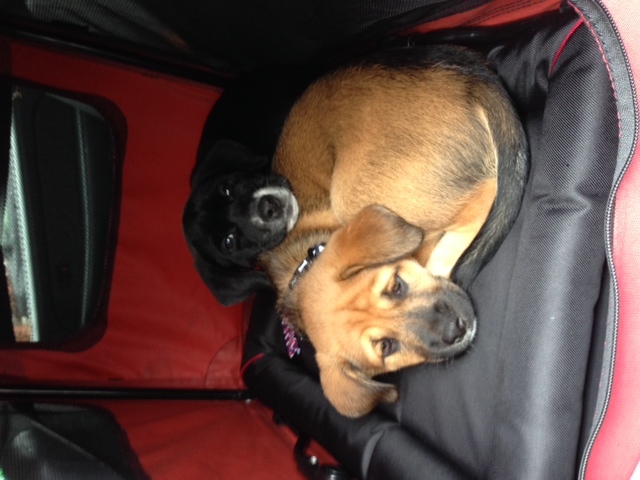 We had a travel crate for them to ride in and set out from the foster home around 10:30 AM. They fussed for the first thirty minutes and then settled in. Around 3 hours into our trip they woke up and we stopped to let them pee. With all of the warnings about Parvo, we took precautions and set out a sheet for them to go to the bathroom on so they wouldn’t pick up any germs from the ground. It was quite a process. Things probably couldn’t have gone better. The puppies slept for the next several hours. We took the New Jersey Garden State Parkway to avoid Super Bowl traffic and kept moving. The puppies slept through our anticipated stop at hour 6. Traffic around DC slowed us down a little but they didn’t notice. A little after hour 7 they started to stir but we were now about an hour from home. We kept moving and after a little over eight hours we were able to introduce them to their new home. Maybe we are crazy for getting puppies right now. 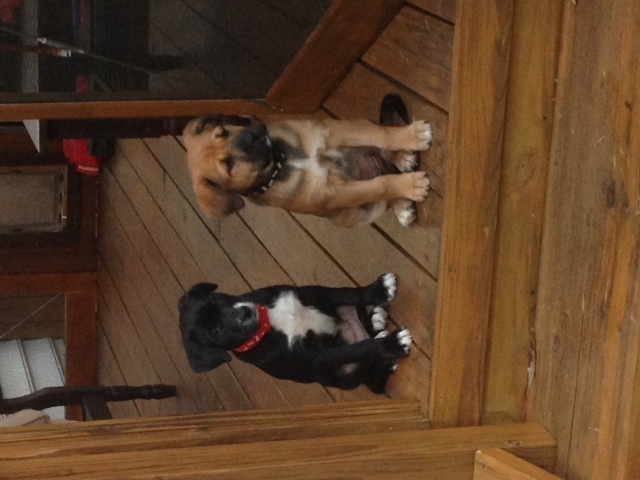 Maybe we are crazy for getting two puppies right now. I would agree driving 1000 miles to get them is crazy. But after a week of this life “adjustment” I think we are going to be okay. They are going to be good dogs and I anticipate we will be good dog owners. Just as they are the central focus of our lives right now, they too will probably be the focus of the next few posts so stay tuned for more crazy!